A golfer needs all sorts of qualities to be a Ryder Cup star - able to sink putts under pressure, fire flawless irons from the fairway, and smoke drives off the tee. Then there are the intangibles - confidence, character and leadership. For one week the solo swingers who tread the globe's greens in a world of their own have to think of others and immerse themselves in the team cause. All this in the maelstrom of matchplay and the backdrop of a raucous crowd in autumnal conditions. Since the biennial clash saw Great Britain & Ireland expanded to become a European team in 1979, some heavyweight names have graced the competition. From Tom Watson and Tiger Woods to Sir Nick Faldo and Rory McIlroy, they have all won and lost. But who is the best? We asked sports statistician Dr Ian McHale to crunch the numbers and apply a special mathematical model in an attempt to discover the greatest Ryder Cup player. Points scored and percentages are often used as ways of measuring performance, but they do not consider other elements. For example, some players might accumulate more points from appearing in many Ryder Cups over a period when there is less competition, while others might shine brightly in fewer contests before having their careers cut short. "During a long career of 11 Ryder Cups, Nick Faldo has accumulated the most points ever (25), but if you work out his points percentage, it is just 54%," said McHale. "Compare this to Ian Poulter, for example who has won 12 points in four Ryder Cups at 80%. Based on their Ryder Cup form - who would win in a head-to-head?" Percentages have their own problems - they don't factor in the quality of the opposition. "One golfer might beat the very best player on the opposing side, while another might defeat the weakest," said the statistician. "Who has done better? Most of us agree it is the man who triumphed against the other team's top player." Our model uses the results of all the fourballs, foursomes and singles matches for every player involved in Ryder Cups since 1979. For the purposes of our final table, they must have played at least 10 Ryder Cup matches. It takes account of the margins of victory, the quality of the opponent, and playing partners in fourballs and foursomes clashes. By doing this, it 'corrects' simpler methods for ranking players which can be inflated (or deflated) by facing relatively weak - or strong - opponents. "When you have lots of results of players, you can work out the relative abilities of all of the players which best describe the results you have observed," said McHale, from the University of Manchester's School Of Mathematics. "This is what we do here. The estimated player abilities should be free of the biases observed in the simpler ranking methods like total points won and points win percentages." In our list of the best Ryder Cup players, American Woods - a 14-time major winner but perceived by many not to be comfortable with the Ryder Cup format - is alongside Englishman Luke Donald. Donald has a 70% points strike rate - 10 wins, four defeats and a half - giving him the joint second best percentage of any player in the last 35 years. Woods has a lower return, at 44% - 13 wins, 17 losses and three halves. Both players are down at 23rd on the McHale model, largely because Woods has played more matches against opponents who have done well in Ryder Cups, while Donald has won more games against lower-rated rivals. Welshman Ian Woosnam is only 43rd despite scoring more fourballs points (10) than any other player in the event's history. He thrived in that format but he could not win a singles match in eight attempts. Perhaps most surprisingly of all, there is no place in the top 10 for Spanish maestro Seve Ballesteros. "Despite Seve being regarded as a trailblazer in terms of Europe turning things around, his actual results [W20 L12 H5] aren't that fantastic," said McHale. "A points percentage of 59% is good, but there are plenty of players with better records. Added to the fact that he wasn't really facing 'great' US players in his matches and he didn't tend to win his matches by big margins, means he is perhaps surprisingly low down the list. "The model doesn't [and couldn't] account for his X factor - his charisma and his leadership qualities." Scot Colin Montgomerie, without a major win but a matchplay colossus, came out on top. "Somehow or other, in Ryder Cup matches, when you asked him to hole a 15-footer to halve or win a hole, he holed it, whereas in the major championships, he never quite managed to hole those crunch putts," said former-team mate Ken Brown, who played in five Ryder Cups. "He was a tremendous match-player, a very accurate driver, had a good all-round game, but his putting was the thing that somehow seemed to come good at the right time in the Ryder Cup. [He was] a heck of a man to have in your side." Montgomerie formed successful partnerships with Nick Faldo, Bernhard Langer, Lee Westwood and Darren Clarke among others, but his leadership qualities particularly shone in the singles, where he won six and halved two of his eight matches and revelled in being sent out first to set the tone. "Monty led from the front," said Padraig Harrington, a team-mate of the Scot's in four of the Irishman's six Ryder Cups. "We put him out there, we were needing the point, wanting the point and he delivered the point and that was the key. "Poulter has done that, he's revived the whole team by winning matches. "It's too simple to say I've got a record of winning X amount. Some players are leaders and those two have led in the Ryder Cup without a shadow of doubt and done far more than just win their own points." 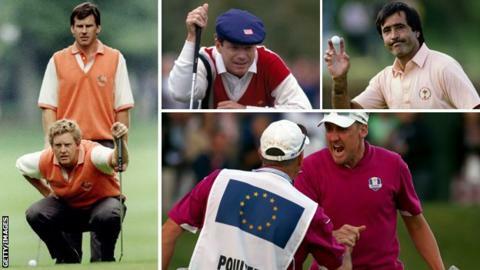 What about the other Ryder Cup legends? American Tom Kite, who finished second behind Montgomerie in our formula, only lost nine out of 28 Ryder Cup matches and never lost a singles match in seven appearances, from 1979 to 1993. "Tom was a tough cookie," says Brown. "Every hole you played you had to win it off him, and he made it as hard as possible for you to do that. Ian Poulter's record bears comparison with anyone in Ryder Cup history, with a 100% record from his four singles matches and eight victories from 11 matches across foursomes and fourballs. "He's been inspired by the competition," notes Brown. "It's obviously in his DNA. He loves matchplay." Nick Faldo may be only joint 13th in our table but he contributed more points (25) than any other player in Ryder Cup history, in a 20-year period spanning a record 11 matches. "That up-and-down from the bank at Oak Hill [in 1995 when Faldo came from one down with two to play to beat Curtis Strange] where he pitched it and left a nasty putt from three-and-a-half feet, down the slope, left to right - that was as good an up-and-down as anyone's ever done in golf," Brown recalled. "The putt was the scariest thing, and he had the heart of a lion when it came to that crunch moment." Likewise Seve Ballesteros may only have a 61% points percentage from his 37 contests in eight Ryder Cups from 1979 to 1995, but his galvanising effect on the European team, particularly in foursomes where he won 10½ points from 14 matches - many of them in partnership with his equally inspired compatriot Jose Maria Olazabal - made him a pivotal figure in the event's history. "Seve was the ultimate gladiator matchplayer," Brown says. "When he joined the Ryder Cup team after 1981 to try and turn the American side over after such a long time, he was the ultimate team player, the ultimate man to tell you 'Yes we're going to do it'. He was almost Pope-like."